Did you know that Mandurah has been identified as a dolphin stranding hotspot? Since 1985 there have been at least 36 live strandings involving approximately 60 animals in the Mandurah waterways. With the vast areas of shallow water, low tides and the hot summer temperatures, our dolphins are in great danger of stranding in the Peel-Harvey Estuary. Each year we have many dolphins that strand, some are lucky enough to be seen by the public in time to be rescued but others are not so lucky. The Peel-Harvey Estuary covers an area of approximately 136km², which is two and a half times the size of Sydney Harbour! The average depth is 1.5m, with over 50 % being less than 50cm. Our dolphins venture far and wide into the shallow areas whilst looking for fish and sometimes they can get caught out by the tides and find themselves in trouble. With many of the areas being so remote and inaccessible by boat or land, often the dolphins can strand unnoticed. Dolphins can survive for hours or sometimes even days out of the water. They are able to survive from being stranded if the tide rises in time to get themselves out of trouble or if they are rescued in time. This is why it is so important to be looking out in the shallows especially over the summer months, the quicker they are found the better chance they have of surviving. If a dolphin strands, they have to wait in the hot sun until the tide rises again. Over time they can get very stressed, sunburnt and dehydrated. Yes dolphins can get sunburnt just like humans! They have highly sensitive skin, shedding a layer every two hours. So you can imagine the damage that is caused whilst they are stranded under the intense sun. The longer they are out of the water, the more stress this puts on their bodies. Dolphins normally have the support of the water to carry their body weight, so if a dolphin is out of the water for too long the weight of their body may crush their organs. Dolphins obtain their hydration through their food, if they are unable to feed then they will start to become dehydrated. Sometimes their fins may collapse due to dehydration. We have several dolphins in Mandurah with their fins bent over as a result of having stranded. There are many dolphins that can be seen around the waterways with white scarring, this is the scar that is left after the sunburn has healed and indicates that the dolphin has stranded but was also lucky enough to survive. One of our resident dolphins Hayley (named in honour of Hayley Dodd), stranded with her calf in November, 2014. They were found in a very remote area in the Harvey Estuary, at the entrance to the Harvey River on an extremely hot day. They were very lucky to have been spotted by a helicopter that happened to be flying over just at the right time! 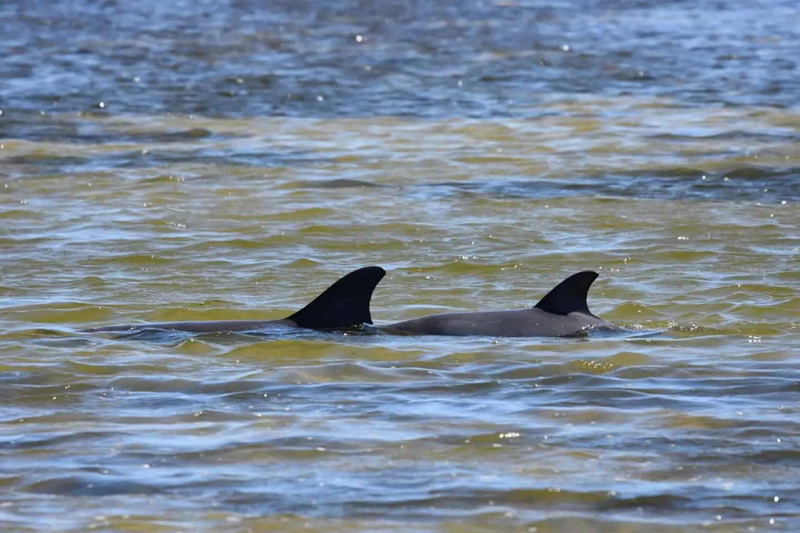 With the research being done by the Mandurah Dolphin Research Project, they have found that over a quarter of our current inland population have stranded at least once in their lifetime! Some dolphins have stranded several times. One of the repeat offenders is Zero One, one of our oldest male dolphins in the estuary. He has stranded at least three times that we know of, however we’re sure he has had many lucky escapes. In 1990 he was trapped in Lake Goegrup along with nine other dolphins, this was also when the number “01” was freezebranded on his fin. (see our blog on freezebranding) In 1997 he stranded again in Lake Goegrup, this time with five other dolphins, who were moved and released into deeper water. Then again in January 2018 he was trapped with another dolphin, in a large pool of water at Herron Point for three days. They were eventually able to escape with the higher tides. We have many dolphins that have stranded and were lucky enough to be rescued by the Mandurah Dolphin Rescue Group. The group was formed over 20 years ago, run by dedicated and passionate volunteers. They are out monitoring our dolphin population on a regular basis and attending to any dolphins in distress, working with DBCA (Department of Biodiversity, Conservation and Attractions) to assist in local rescues. As the weather gets warmer and with the low spring and summer tides, we are coming into a crucial time of year when it is important to have people looking out around the shallows of the Peel-Harvey waterways. Some of the danger spots are along the rivers and lakes, especially Lake Goegrup and the lakes upstream from the Serpentine River, the south east side of peel inlet and across any shallow banks. If you ever see a stranded dolphin or a dolphin in distress please contact the Wildcare helpline on 08 9474 9055. Here are some tips from the Mandurah Dolphin Rescue Group about what to do if you find a dolphin that has stranded. Another way you could help out, if you don’t live locally is by donating to the Mandurah Dolphin Rescue Group. They would welcome any donations to help attain further rescue equipment, to ensure a prompt response to any future rescues. Please feel free to ask any questions you may have below and we’ll have our expert dolphin team answer them. To book a dolphin tour with us, click here.